One major reason why I love using Android is automating many everyday activities with the aid of mobile applications like Tasker and NFC Tools. But one of most primary tasks I automate is triggered when Bluetooth successfully pairs and connects with a speaker, which I use multiple times a day. Every morning, I connect to the waterproof Bluetooth speaker in the shower. On the drive into work, I connect to the Bluetooth speaker in my car. Throughout the day at work, I connect to the small Bluetooth speaker at my desk. On the drive back home, I connect again to the Bluetooth speaker in my car. So throughout the day, I connect to a total of three different Bluetooth speakers. However, I've noticed that the more Bluetooth devices I have pair with my Pixel 2, the slower it takes to pair if I'm cycling between different Bluetooth devices. Most likely because the smartphone attempts to pair with last connected device. It attempts to connected for a set time before it attempts another device. This causes the Bluetooth to take forever to pair. So in an attempt to speed up the process, I usually manually open the Bluetooth menu to select the actual device. But this completely defeats the purpose of Android automation, so I was looking for a better solution. NFC stands for Near Field Communication and is a way for two devices to establish a connection over a very short distance, around 4 cm or 1.6 inch. Because the range is so short, it uses very little battery. NFC uses much less battery than other radios like Bluetooth, WiFi, or cellular. Therefore, it's efficient for NFC to be left on all the time. NFC is also the same technology behind mobile payment services like Android Pay or Apple Pay. So if you're using either, that means your phone is NFC ready! The difference is that Google allows other Android app to use NFC where Apple locks NFC to only certain applications. The goal is to configure your NFC tag so it sends the address of your Bluetooth device to your mobile device so an immediate connection can be initiated. Therefore, you Android phone won't have to guess at which Bluetooth device you're trying to connect to. This process mimics you turning on Bluetooth and manually selecting the correct Bluetooth device. Download Trigger (Free on Google Play): This first app responsible for writing instructions to your NFC tag. The main goal is to create the steps to "write" to your NFC tag. It will be one step: you want to write the address of your Bluetooth device. If you're previously paired it, this process will be much easier. Download Tasker ($2.99 on Google Play): This second app can detect when a Bluetooth connection is established (from the Trigger application) and then do an additional steps such as launch Spotify, adjust media volume, simulate play. Note that even though Tasker costs money, its well worth it. You'll soon find many other tasks that can be automated. Place NFC Tags (~$1.25 each on Amazon): This is the actual NFC tag that you'll write data to from the Trigger app. Additionally, whenever you want to pair to your Bluetooth device, you'll want to place a stick near that device. So I have one in my car, one on my work speaker, and in the bathroom near my waterproof shower speaker. 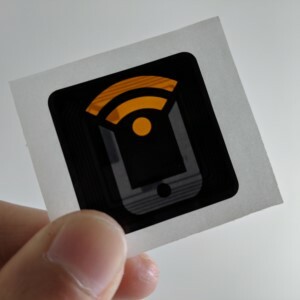 Note that depending on the NFC tag that you purchase, some are not as well shielded as others, and placing the sticker on a metal surface may prevent the NFC tag from working properly.